Good Stuff NW: Improving on Mac'n'Cheese? Is it Possible? I wasn't sure if I was courting disaster or on the verge of discovering a fabulous new world. Not that I'm any Amerigo Vespucci or Ferdinand Magellan, but I sure know how they must have felt when they got to the edge of the map that stated in capital letters "HERE BE DRAGONS." 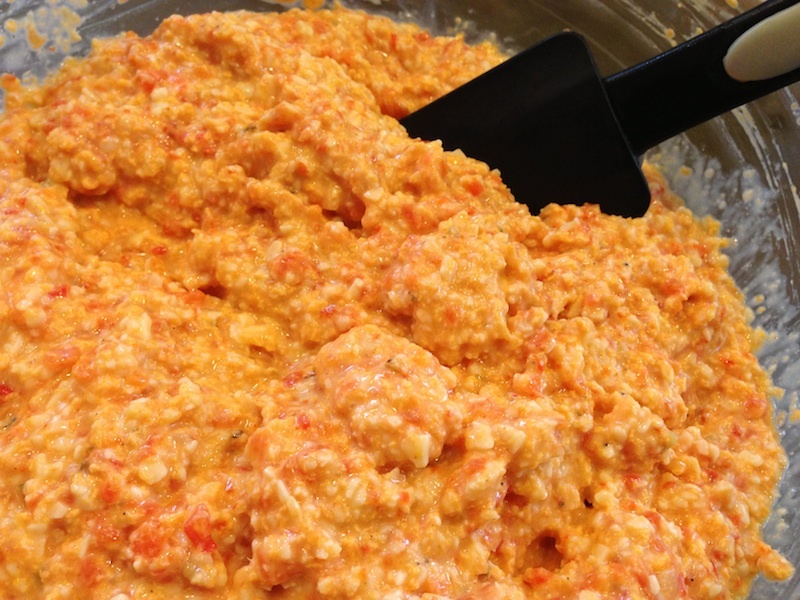 Incongruous as it seems, it all started with a batch of pimento cheese dip. I'd made it to take to a Super Bowl event, though I only needed a small portion for the party (which was summarily scarfed down and the bowl practically licked clean). So when we got home there was plenty left over and I wondered what the heck I was going to do with it. Inspiration struck the next night as I was casting about for what to make for dinner. 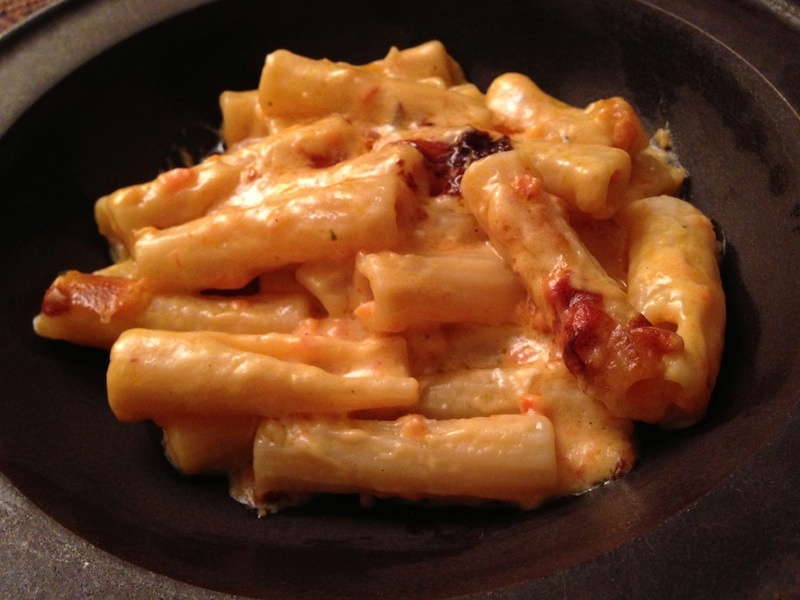 Hm…a cheesy mix of cheddar and roasted red peppers, just about the right amount for mac'n'cheese. 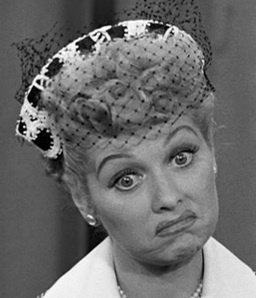 Now, most of the time when I get these wacky I-Love-Lucy type ideas it's pretty low risk, but this time I was potentially wasting a pound of very good cheddar, not to mention the possible humiliation when I put a pan of inedible glop in front of my family. 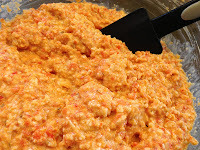 Casting aside my fears, I sailed forth and found that the cheese dip melted oozingly into the milky roux, with a certain promising je-ne-sais-quoi from the slight amounts of relish, bourbon and Crystal hot sauce from the dip recipe. I said a little prayer to the dinner gods as I mixed it with the pasta and poured it into my lucky casserole dish, then set the timer for 30 minutes. 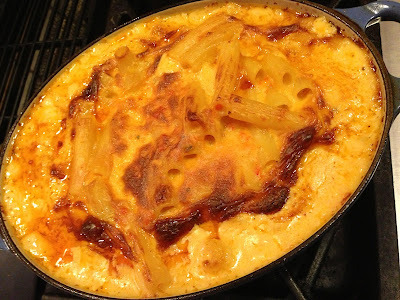 The aroma of bubbling cheese filled the kitchen, and pulling out the sizzling, perfectly browned casserole from the oven made me want to shout out the kitchen equivalent of "land ho!" The subsequent ooh-ing, ahh-ing and slurping confirmed it was a successful voyage, the only dragons being those of my own doubts, which were slain without further ado. Preheat the oven to 350°. Bring a pot of water to boil for the pasta. Put the pasta on to cook while you make the sauce. Melt the butter in a saucepan over medium heat. When it has melted, turn off the heat and add the flour, stirring until completely combined with no lumps. Return the heat to medium and cook the flour and butter, stirring constantly to avoid burning, approximately one minute. Add the milk slowly, stirring to prevent lumps and avoid scorching until it thickens. Add cheese mixture in large spoonfuls, stirring to melt after each addition. Add cream cheese and stir until it melts. Season to taste with salt. Drain pasta and put it back in the pot. Add cheese sauce and stir to combine. Pour into preheated casserole dish. Bake for 30 minutes until browned and bubbling.